It’s barely news anymore that Derrick Jones, the first graduate of the Union’s youth academy to make it to MLS, isn’t playing much. He is fourth on the defensive midfield depth chart at this point behind Haris Medunjanin, Jamiro Monteiro and Warren Creavalle. But after playing in the Union’s games at Kansas City and Atlanta, Jones has now gone two straight weekends without playing for either the Union or Bethlehem Steel. That has raised some flags. You could excuse his not playing in the last weekend of March, since the the 22-year-old had just spent a week with the U.S. under-23 team in Spain, and played in both the squad’s friendlies: 45 minutes against Egypt on March 22 and 35 minutes against the Netherlands on March 24. This past weekend, though, felt like a different story. There were no apparent mitigating circumstances to Jones’ absence from both squads. Only on Wednesday did we find out otherwise. 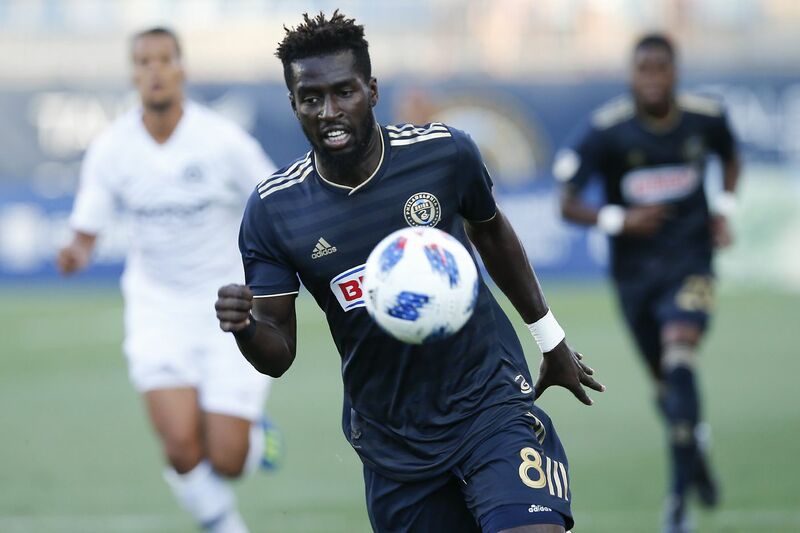 Union manager Jim Curtin and Steel coach Brendan Burke confirmed that Jones was to play for Bethlehem last Saturday at Swope Park Rangers, Sporting Kansas City’s USL team, but he was sidelined by an ankle injury suffered the day before. Bethlehem has two games in quick succession coming up: Saturday at Talen Energy Stadium vs. the Charleston Battery (7:30 p.m.), then Tuesday at the Charlotte Independence (7 p.m.; all Steel games are streamed on ESPN+) Curtin said the squad for the latter game will have many Union reserves who don’t go to Los Angeles for Saturday’s game against Zlatan Ibrahimovic’s Galaxy (10:30 p.m., PHL17). Jones said Wednesday that he’s optimistic he’ll return to the field soon. Jones is likely only on the fringes of the player pool for the Olympics, where all but three players on each roster must be age 23 or younger. Auston Trusty is the Union’s leading candidate. But the fact that Jones is even being considered at a time when U.S. stars like Josh Sargent, Tyler Adams, Weston McKennie, Tim Weah and even Christian Pulisic are age-eligible is a big compliment. “He’s got a ton of talent,” Curtin said of Jones. " We judge him in training, and that’s kind of, right now, all we can judge him by." Coincidentally, Curtin had a phone call with U.S. Olympic team coach Jason Kreis scheduled for after his Wednesday meeting with the media. Jones said he appreciated the national team call-up and the lessons Kreis shared.